Small scale agriculture is one of the most important, yet least addressed, drivers of deforestation in the tropics today. In our Sustainable Agriculture Program, Acaté partners with expert Matsés farmers to develop innovative approaches to restore devitalized and eroded lands to abundance. Slash and burn agriculture, once superbly fitted in skilled hands to semi-nomadic existence, is not sustainable for fixed settlements, where swift erosion of cleared farm land results in ever-widening rings of deforestation around villages. Increasing archaeological evidence suggests that the Amazon Rainforest once supported large vibrant communities before the scattering and fragmentation that followed European conquest and disease. Indigenous knowledge of how to maintain soil fertility against erosion and support large communities was lost. 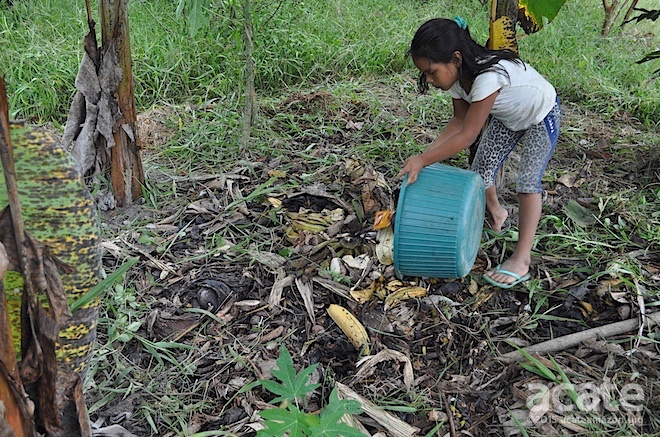 In the below report, Acaté field coordinator Dave Fleck presents our experiments with plantain circles, ongoing since 2012, in our pilot farm in the Matsés village of Estirón. The lessons learned here and rediscovered through trial and error can be applied to transform slash-and-burn agricultural practices throughout the tropics into a more sustainable approach that utilizes patterns observed in natural ecosystems. 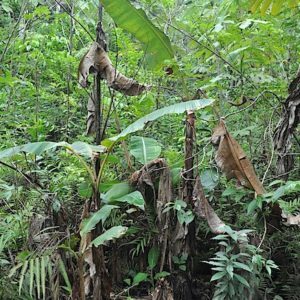 The results of our plantain circle experiments among the Matsés should be of interest to anyone who has started to or is planning to implement a permaculture project in the Amazon. The aim of this report is not just for readers to benefit from the lessons we have learned through our successes and failures; but we are also hopeful that those who read this will share ideas and suggestions about how to grow plantains organically and sustainably in the tropics. Nineteenth-century explorer-naturalists, impressed by the lush jungles, jotted in their journals their predictions that the rich fertile soils of Amazonia would one day become the breadbasket of world. But alas, they were mistaken about the soils. The nutrients in the Amazon rainforest are stored in the biomass, and the clayey ground is barren with only a very thin layer of topsoil that quickly erodes away when the forest is cleared. 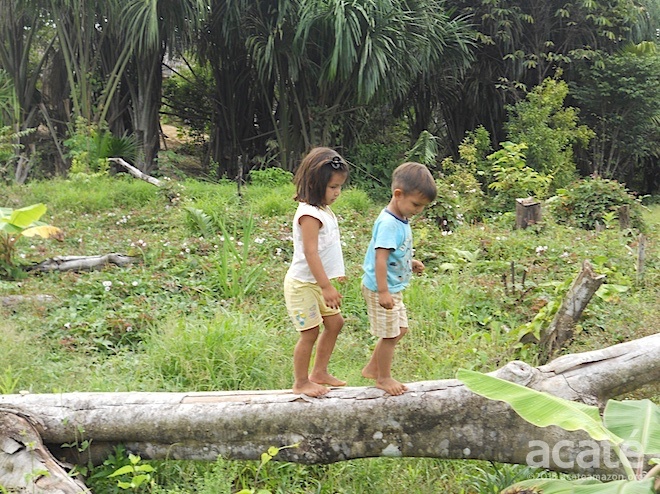 I have farmed in the Amazon – it’s not easy for the inexperienced. Observation of the bounty of indigenous Amazonians’ agricultural production surely contributed to the early naturalists’ inaccurate assumption about the soil. While carrying out field research among the Matsés for 13 years and farming and living with them permanently for another 8 years, I have observed that Matsés swidden agriculture is extremely efficient: they put in a relatively small amount of time and energy creating and maintaining their swiddens, and they produce a year-round surplus of starch staples and vitamin-rich fruits for their families. An accomplishment that is all the more impressive taking into account the poor soils. 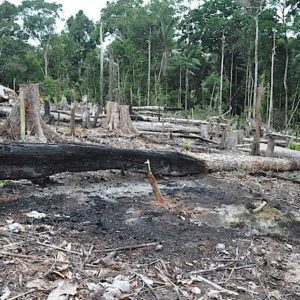 “Swidden” is the classic anthropological term for what is now more frequently referred to in as “slash-and-burn agriculture,” a term that tends to elicit frowns from rainforest conservationists. 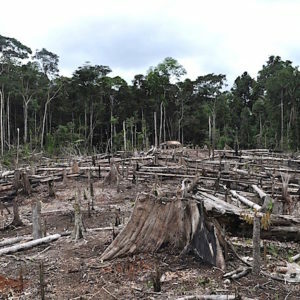 This is because in areas where there is a limited amount of rainforest relative to the population density, this type of agriculture often results in the obliteration of primary rainforest, extirpation of the local fauna, and degradation of the soil. 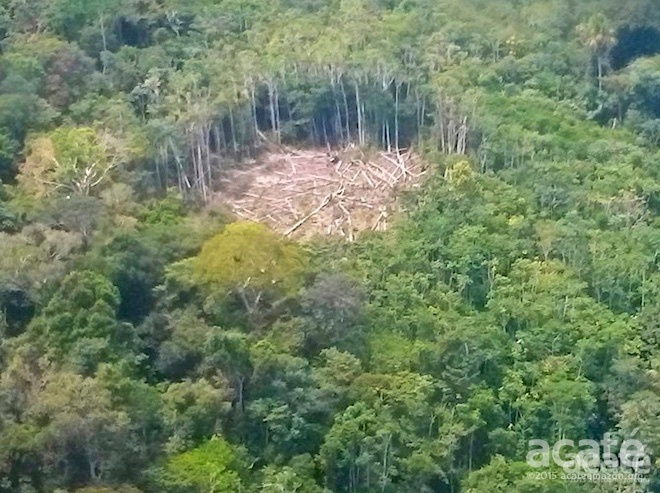 The Matsés, however, farm less than one percent of their territory, making small plots (1-2 hectares) in selected terrain, leaving large patches of adjacent primary forest intact. The Matsés abandon their swiddens after only a few years, allowing secondary forest to replace the swidden quickly (forming a closed canopy in 15-20 years), which eventually becomes indistinguishable from primary forest (in about 50 years). In fact, small-scale swidden subsistence agriculture creates habitat diversity and increases the density of some animals that thrive in secondary forest (like pacas, agoutis, and nine-banded armadillos), and are visited by collared peccaries, parrots and other animals that feed on peach palm fruits, old manioc tubers, and other plants that continue to produce after the swidden is abandoned. My opinion is that there is more we can learn from the Matsés about farming than we could teach them. There is, however, one caveat: Matsés swidden agriculture is perfectly adapted to their pre-contact semi-nomadic lifestyle, but due to their recent change to a sedentary settlement pattern, a few deficiencies have arisen. Specifically, these are a shortage of protein and the inevitable consequence that swiddens are constantly made further from the village, requiring women to transport the harvest long distances. The Matsés initially pointed these problems out to me in informal conversations, and more recently these issues were discussed at the May 2015 meeting with all the Matsés chiefs and medicine men, where the Matsés leaders asked Acaté Amazon Conservation to help find solutions. Before they made first contact with Summer Institute of Linguistics evangelical missionaries in 1969, every three years or so the Matsés moved their settlements to a new, often distant, locality where animal game was more abundant. This abundance of game was complemented well by the Matsés’s starch- and mineral-rich, but protein-poor polyculture swidden production. We are responding to the Matsés’s request for assistance with the current shortage of meat in their modern sedentary villages by experimenting with some high protein crops like pigeon peas, cowpeas, and peanuts in small plots of cleared secondary forest adjacent to Matsés homes. I refer the reader to the Acaté June 2014 field report for a description of this experimental permaculture, where an overview of Matsés traditional polycropping is also included. In the present field report I will describe the design and results of our experiment with plantain circles. It is important to emphasize that we do not suggest replacing or modifying Matsés swiddens. Rather our aim is to show the Matsés a way to create a supplementary source of a starch staple near their homes with minimal labor. As mentioned in the June 2014 field report, our strategy is to test our permaculture designs prior to implementing them in large-scale projects in the Matsés villages, to make sure that they actually work and that they are compatible with Matsés culture and modern lifestyle. Plantains differ from bananas in that plantains are larger, drier, starchier, and have thicker skins, while bananas are sweeter. The Matsés plant about 8 different varieties of bananas and 3 of plantains. The three plantain varieties are: mani misin ‘thinner plantain’, mani chëshë ‘black plantain’ and mani bënë ‘male plantain’. 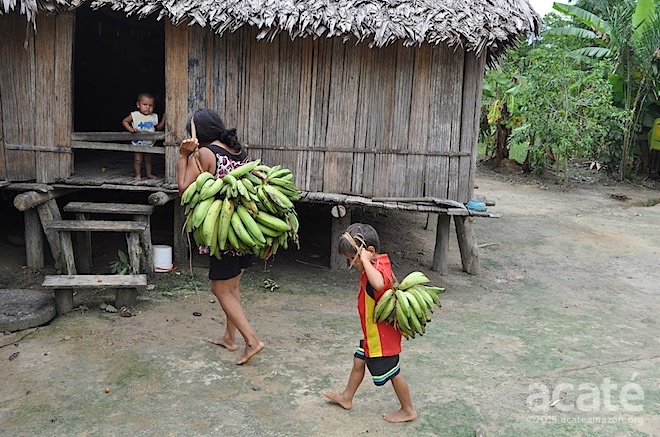 Plantains and bananas have different cultural values for the Matsés: bananas are eaten as snacks, mostly by children, while plantains are a principal starch staple, almost as important to them as manioc. They boil or fry plantains green or ripe as a side dish, or allow them to ripen until soft to make different types of beverages. These beverages are important to the Matsés to the point that they do not consider a meal complete without their plantain beverage. Plantains are less frequently grated and used to thicken soup or to make small cakes. 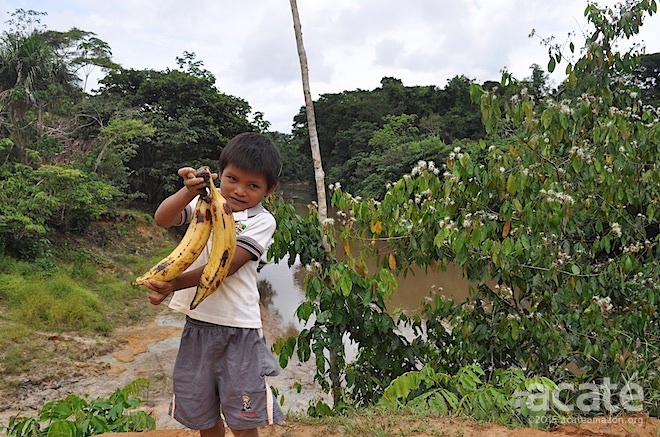 The Matsés typically plant in their swiddens about 9 plantain plants for every banana plant. All the varieties of plantain take about 12 months to produce harvestable fruits, while some varieties of bananas produce mature fruits in only 9 months. Plantains seem to require more nutrients than most varieties of bananas and are more susceptible to pests (especially root-and-stem boring grubs) and disease when nutrients become low, such that the plantain plants tend to die or stop producing usable fruit before most varieties of bananas. Specifically, plantains in a Matsés swidden tend to produce good bunches for up to two years. After that, especially if the owner of the swidden decides to continue weeding, some of the plantain plants will continue to produce smaller bunches for 6 months or a year, particularly if they are in a patch of rich soil. Some sad-looking plantain plants in a 3-year-old swidden. The Matsés make a new swidden every year, almost always during the dry season (June to mid-September) and abandon them after 2 to 3 years. Plantains and bananas are planted in the following manner. After the swidden is burned, any branches and small logs that remain unburned are piled up and re-burned, leaving piles of ashes, several centimeters thick and 1-4 square meters in area. The Matsés plant plantains and bananas from suckers (baby plants that grow from the corm/rhizome of a larger plant) that they cut away from healthy adult plants. To avoid transferring pest infestation (such as insect eggs), they cut the leaves from the sucker, peel off the outer part of the stem, shave the exterior of the corm, and wash and scrub the sucker in water. One sucker is planted right in the middle of each of these piles of ashes. Manioc and other crops are planted in the rest of the land, but never within two meters of the plantain or banana plants. After about 5 or 6 months, suckers begin to emerge at the bases of the first plantain plants. Other than weeding, there is no maintenance. Plantain suckers ready to be planted. 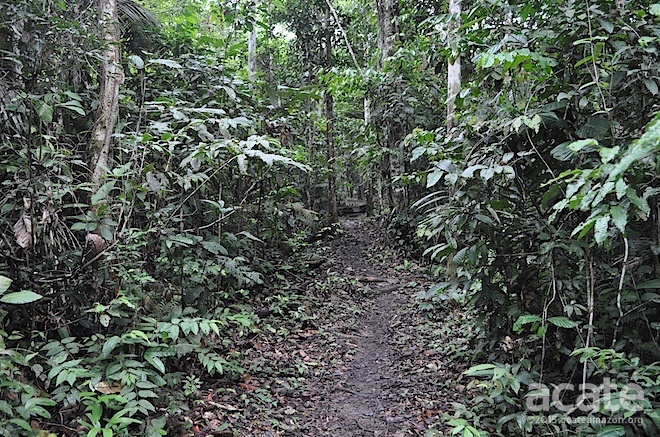 The Matsés typically clear secondary forest near their homes to keep the forest at a distance, and often take advantage of this cleared area to plant some plantains and bananas. 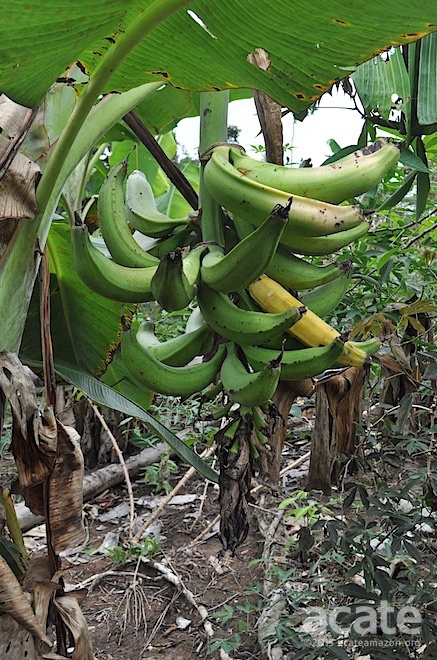 However, in these cleared secondary areas the plantains produce at best only one very small bunch, while some of the smaller types of bananas may produce good bunches for several years in such areas. 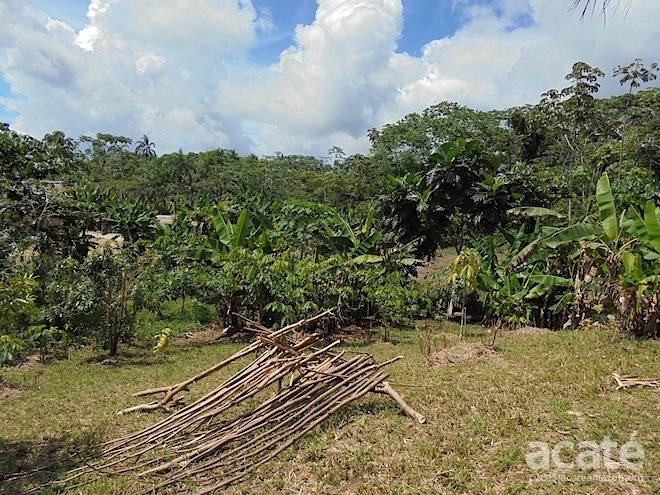 These areas of cleared secondary forest quickly become covered by grass and weeds, which not only compete with the plantains for the few available nutrients but also attract snakes and animals that prey on their chickens. 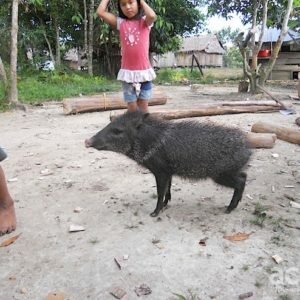 To keep these pests at bay, Matsés men cut the grass in the proximity of the homes every 2 or 3 months using machetes. Considering the greater dietary importance of plantains, their seasonal scarcity, and the difficulty growing them in cleared secondary forest, we decided to experiment with plantains circles instead of banana circles. Banana circles are a tried and true permaculture technique, but as will be revealed below, plantains are trickier to plant using this design. In March of 2012, I planted 3 plantain circles in a cleared 15-year-old secondary forest area adjacent to both my house and my mother-in-law’s house at the Matsés village called Estirón. The area had been cleared by my brother-in-law 7 months before, because he did not want tall forest adjacent to our homes. After it was burned, my wife’s grandmother planted a few plantains in this area. By the time I made the plantain circles, this area had been overrun with grass and weeds, and none of my wife’s grandmother’s plantain plants looked very healthy. The plantains planted by my wife’s grandmother (which henceforth I will refer to as the “pre-existing plantains”) served as a sort of control group, to allow us to compare their growth and production with those in our plantain circles in the same area. The design consisted of 4 or 5 plantains planted in a circle (or square) around a pit that was dug 80 cm deep with a 150 cm diameter. 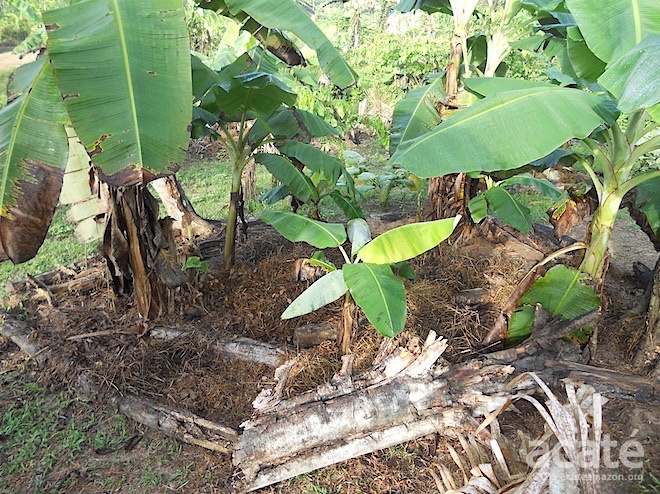 The dirt-clay from the pit was piled up forming a circular mound in which the plantains were planted, as is often suggested for banana circle designs. Malanga plants, small cultivated taro-like plants in the Araceae family with “elephant ear” leaves and edible tubers, were planted between the plantains as ground cover in some of the plantain circles. One of the plantain circles was formed with two of the pre-existing plantains, to see if the input of nutrients would make them healthy. Malanga (Xanthosoma sagittifolium). The tuber grows the size of a softball. All organic household refuse (mostly plantain and manioc peels, but also uneaten food, fish and animal bones, feathers, discarded palm leaf baskets, etc.) from my house and my mother-in-law´s house was deposited daily in the pits. Ashes from the hearths were deposited in the pits and around the bases of the plantain plants. Grass clipping were deposited in the pit and used to mulch the general area of the plantain circles to reduce the growth of grass and weeds. Logs were placed forming a circle around each plantain circle, to keep chickens from dispersing the grass clippings. The areas within the circles of logs were weeded monthly and the weeds were also deposited in the pits. Chicken manure could have served as a high-quality, though not plentiful, fertilizer. 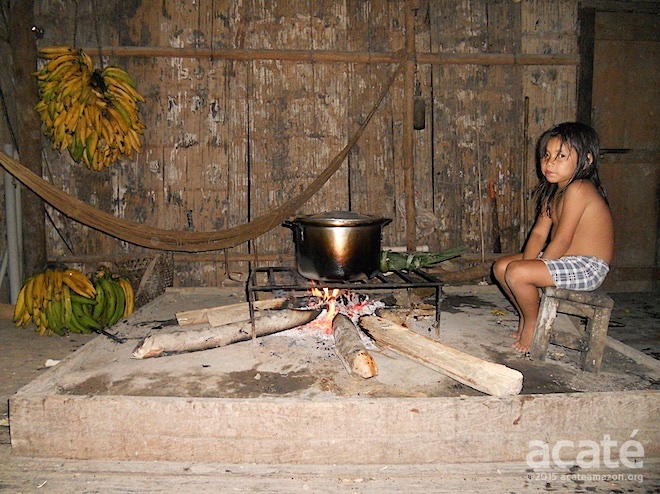 However, the Matsés consider it disgusting and said they would not eat bananas that were “spoiled” with chicken poop. Dumping the kitchen refuse in the (now full) pit. 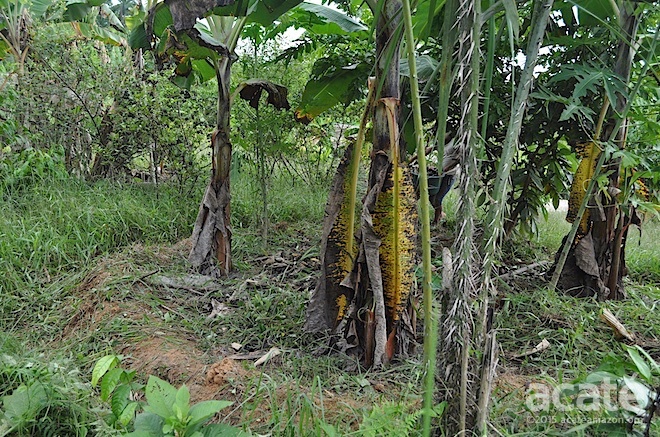 In June of 2012 Inga edulis trees (called “guaba” in local Spanish and sometimes called “ice cream bean” in English) were planted from seed in a circular configuration around the plantain circles, about 2 meters from the plantain plants. The purpose of the Inga trees was threefold. The first was to produce shade in the area, to protect the soil from rain and sun and to reduce the growth of grass. The strategy is to keep the Inga trees pruned to keep them from growing taller than the plantain plants and shading them out. The second purpose of the Ingas is to use their leaves as fertilizer for the plantains when the Inga trees are pruned. The third reason has to do with nitrogen fixing. Inga edulis trees have bacteria that capture nitrogen from the air and make it available for plants. Their burrow deep into the soil and accumulate nitrogen in their roots. 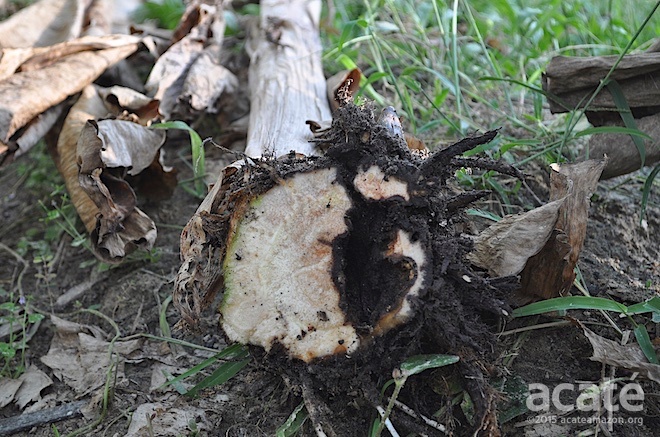 When the trees are pruned, some of their roots die and make nitrogen available to the plantain plants. A fringe benefit of this is that Inga edulis trees are good firewood, so the branches of the pruned trees become a source of fuel close to the home. Another sweet thing about planting Inga edulis trees is that, as one might guess from their English name, children enjoy cracking open 80-cm-long pods and eating the tasty creamy pulp that encases the seeds. When the plantains began to produce suckers around the mother plants, only one daughter sucker was allowed to grow next to each mother plant. When plantains were harvested, the plant was cut down, chopped up, and placed in the center of the plantain circle (leaving the daughter plant intact). 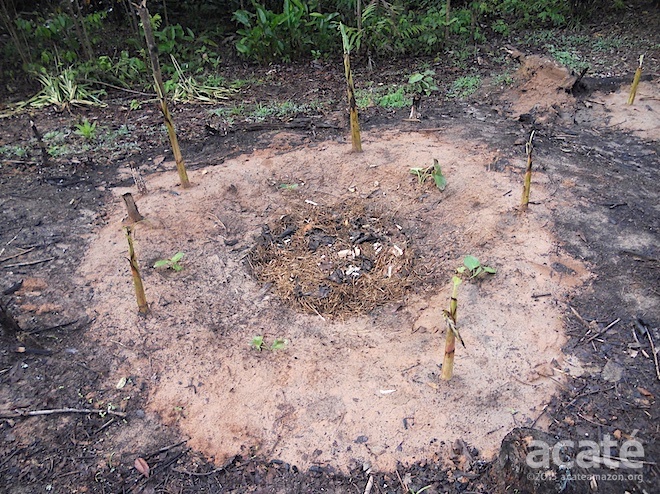 In August 2012 (5 months after I planted the first plantain circles), I planted 2 new plantain circles in a newly-burned experimental permaculture plot (the one described in the June 2014 Acaté field report). As the Matsés usually do in their swiddens, branches and small logs that did not burn were cut, piled up, and re-burned. The banana circles were placed in spots where there were lots of ashes from these burned mounds. While essentially the same design was used, we did not have enough household refuse and ashes to fertilize this second set of plantain circles. Instead we filled the pit with rotten logs, grass clipping, and weeds from the experimental plot. The pre-existing plantains (i.e., those previously planted by my wife´s grandmother) were short and sickly. The few that were planted where there were concentrations of ashes produced small but harvestable bunches. 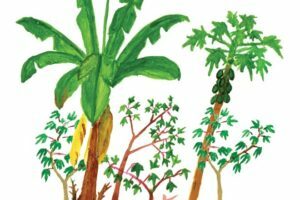 The rest of the pre-existing plantain plants died before producing fruit. The plantain circle formed with two of the pre-existing plantains did not do well either: these plants were infested by root-and-stem-boring grubs and the other plants in the circle were soon infested as well. Plantain corm (root) damaged by grubs. 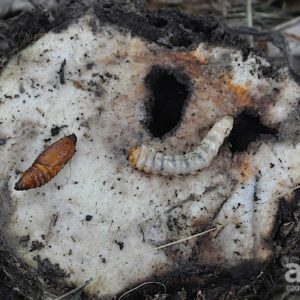 These grubs begin by boring into the underground corm of the plant, and then work their way up the center of the stem. 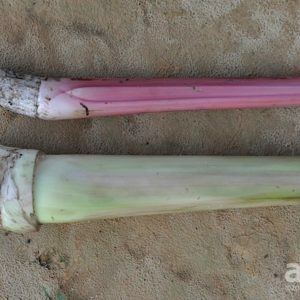 Since new leaves and the flowers/ fruits grow from the middle of the stem starting at the base, once the grub begins boring into the stem, the plantain plant is done for. The plantains circles in the experimental horticultural plot did not do well either. In the beginning, the plants were healthy and grew quickly, presumably due to the ashes from the burning of plot and the re-burning of the piles of remaining branches and logs. (Note that in secondary forest there are fewer branches to burn and most trees have soft wood, so there are fewer ashes than in swiddens made of primary forest.) By the time they had grown to maturity, the plantain plants in the experimental plot did not look too healthy, and the first set of bunches were medium-sized. After that most of the plants stopped producing fruits, fell over before the fruits matured, or produced tiny bunches that were almost not worth harvesting. 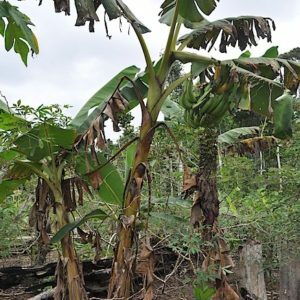 As mentioned above, we did not fertilize these plantains continually with household refuse and ashes, and the trunks and leaves of the harvested plants did not serve as fertilizer until after the first year, when the plantains were already in bad shape. The plantain in these circles did not do much better than plantains that the Matsés plant in piles of ashes in cleared secondary forest (with no fertilizing and occasional weeding or grass cutting). The remaining two plantain circles (the one planted in the area that my brother-in-law had previously cleared) did exceptionally well. After one year they produced very large, healthy bunches. Several months later, the daughter plants also produced large bunches, surpassing the expectations of the Matsés. Large healthy bunches continued to be produced for 2.5-3 years. After that they began to become infected with root-boring grubs (despite the constant input of household waste and ashes), and produced smaller bunches with thinner plantains for several months and then began to die before reaching maturity, or toppled over before their fruits grew large enough to be harvested. In August 2015, 3.5 years later, the plantain circles were abandoned and a new one established in a different locality. The malanga plants that were planted for ground cover did well for the first year, but then they died, presumably because they were shaded out and outcompeted for nutrients by the mature plantain plants. However, the adult plantain plants and constant mulching with grass clipping served as good cover in their stead. We were able to harvest the malanga tubers only one time. The additional source of plantains was much appreciated by my mother-in-law, particularly since the first harvest became available during a period when there was a scarcity of plantains in the swiddens (since the plantain circles were planted in March). She and other Matsés were impressed in light of their experience with plantains otherwise not producing well in such cleared secondary areas. The input of energy was minimal compared to the output of calories. Each plantain circle was created in only a few hours. The Matsés normally discard their household refuse and hearth ashes a bit far from their homes, so we were able to convert the refuse and ashes into an important fertilizer without introducing an additional chore. Likewise, the grass in the area was already being cut every few months, but the cut grass clippings were not being utilized. The mulching with grass clippings took only about one hour, and the grass clippings made weeding around the plantain circle negligible. 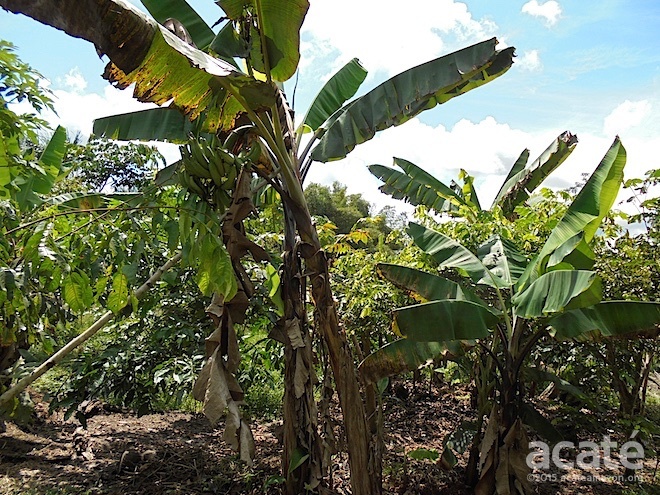 Although the plantains eventually died due to pest infestation, the three years of constant fertilizing converted the poor red clay soil into rich black soil, so rather than abandoning these sites completely, I planted papayas and bananas of a particularly pest-resistant variety. Alternatively, a tree could have been planted in these patches of enriched soil. Overall, the experiment was a success: we hit upon a design that effectively uses land that would otherwise have been of little use to the Matsés to produce food close to the home by recycling trash, without imposing a lot of extra work on the Matsés. Additionally, we learned several useful lessons from the failed plantain circles, and got some nice plantains to eat in the process. It is not a good idea to create a banana circle with existing ill plants. The plants should be healthy and well fertilized from the start. The Inga trees took about 2.5 years to grow to a size that they could be pruned. By the time they reached that size the plantain plants were already in decline, so they did not contribute much to the growth of the plantains. 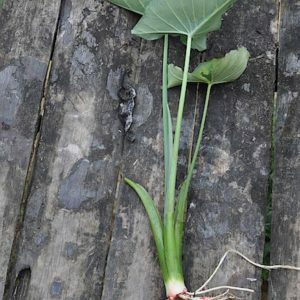 I would recommend planting the Inga trees from large seedlings, rather than from seeds, and fertilizing them with ashes and mulching them with grass clipping from the start. The plantain circles were a bit too far from the home (about 60 meters). This resulted in that sometimes the children who were asked to throw out the trash dumped it in other places a bit closer to the house. Children had to be nagged to take it all the way to the plantain circles. Another issue was that the organic refuse was mixed with plastic waste. To facilitate separating the trash, I later dug a pit next the plantains circles where the plastics could be dumped after separating them from the organic refuse. The plastics were buried in the pit once full. The circular mounds made with clay and soil from the pits were hard to keep covered with mulch. I recommend instead using the clay and soil from the pit to create a circular mount beyond the plantain, at the edge of the area that will be kept mulched (to serve a similar function as the logs, to keep chickens from dispersing the mulch). If the plantain circle is on an incline, the mound could me made larger on the downhill slope. Taking into account these lessons, in May of 2015, I constructed another plantain circle 40 meters from my mother-in-law’s house. This was close enough that the children did not dump the trash elsewhere, but not so close that the garbage could be smelled from the home. This time I made a single plantain circle instead of three to see if the greater amount of refuse and ashes would result in the plantains being able to ward off pest infestation for a longer period. Also, the Inga trees surrounding the plantains were planted from large seedlings, are being fertilized with ashes in the hope that they will grow large enough to be pruned in a shorter time. In a few years we will report on whether these plantains will produce healthy bunches for a longer period than the original plantain circles. We welcome from our readers any comments on their experiences with similar plantain or banana circles, and any suggestions on how to improve our design, especially any knowledge about fighting pest infestation. The new plantain circle (5 months old). 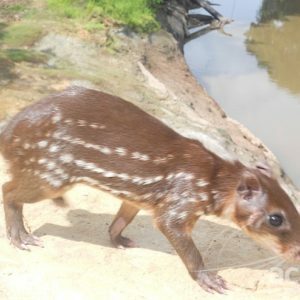 Postscript: I wrote this report while in Estirón (the Matsés village where I live). I expected that once I came to Iquitos (a small city in Amazonian Peru) to turn in the report, I would be able to find on the internet the scientific name of the pest that I have been provisionally calling the “root and stem boring grub”. As it turns out, there is a very common banana/plantain pest, Cosmopolites sordidus (common name banana weevil, banana root borer or banana weevil borer), a native of Malaysia and Indonesia that has spread to banana-growing regions throughout the rest of the world. The morphological and behavioral descriptions of Cosmopolites sordidus fit well with those of the pest I encountered, but C. sordidus grubs (and adults) grow only to 12mm, while the grubs that I found were about 5 centimeters long. A giant by comparison, and surely a different species (the pupa also looks different), but I have not been able to identify it. Could it be a new species? Additionally, upon arrival in Iquitos, I learned that plantain harvests had failed drastically in the area due to grub infestation, though I don’t know if these were C. sordidus or my giant grub. Therefore, it would be of much interest if readers have knowledge about banana root boring grubs that they could share with us. On my part, I will see if I can get one the pupa to hatch in captivity to see what the adult looks like. Acaté field coordinator Dr. David Fleck is a fully integrated member of the Matsés community and lives with his wife and two sons in one of the most remote villages. In addition to almost 30 scientific publications, Dave has co-authored with the Matsés an authoritative book on their culture, the most comprehensive dictionary of the Matsés language, the first written history of the tribe as told by elder Matsés historian Manuel Tumí, as well as several educational materials in the Matsés language for their primary schools. Am very impress with the info read from this web page we should put into practice would like to know more. I was very pleased reading you and clarifying my understanding. It is sad that the so evolutioned and friendly environmental matses techniques now are disturbed by western influences like “modern” settlements, political borders, etc. – To be your wife’s grandmonther plantains a control maybe they should started at the same time that your experiment (beacuse the yield decline in time) . And applied equal treatments (ashes, home refuses, mulching, etc.) Then you could distinguish the real value of plantain circle (that I’m sure is real and worthy). – What did you do with the original top soil? If it was mixed with the clay to build the mound I think we are against the natural evolution of soil (mixing poor mineral soil with rich soil) maybe could be better to separe it and fill the holes with it before planting, then the rich soil will be easily available for the plantains roots, and they do not have to spend time, energy and materials to acces the worthy nutrients that nature put in the proper place. – Are you sure “guaba” storage nitrogen in their roots? I think it is fixed in the roots, then it moves quickly to the places where the proteins are builded (i guess leaves), then the proteins moves where tissues require it. Great article. The white grub you have found looks remarkably similar to one we have in the Philippines. They call it abaleng/abalin and it’s often found in rice fields or in the soil. In fact the people eat it here. It’s a good source of protein apparently. I don’t know if it’s the same species or if it effects bananas/plantains. From a quick Google search, I believe it could be June beetle larvae, which is also found in North America. be informed lots of new stuff proper right here! Good luck for the next!